This is the second in our series on making the most of your MxToolbox account. Today we’ll talk a little about blacklisting. An example of blacklist results. 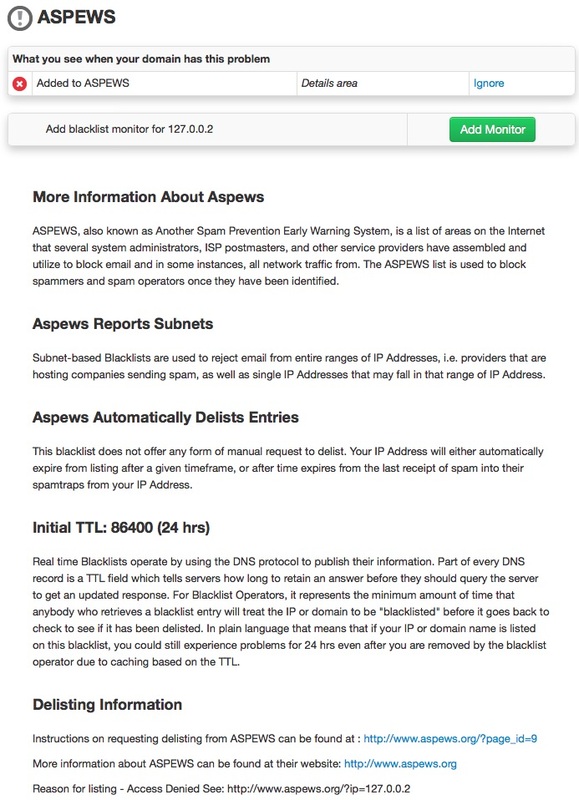 Blacklist lookups check our extensive list of blacklists (up to 100 for paid subscribers) and operate in two modes: IP address or Domain blacklists. This is one of those where checking blacklists for IP addresses produces different results than using a domain. Read more below. For email senders, Blacklists might seem to be a nuisance. Who are they to prevent you from emailing your customers? Well, they are legitimately used by nearly every email provider on the internet to reduce spam. Blacklists setup honeypots that receive spam and use this spam in their algorithms to block illegitimate email. In fact, Blacklists reduce the amount of email your servers process by as much as 90%. Think about that for a second… Your server would need to be 10x more powerful to process all the email you receive without using the email filter capability a blacklist provides. Blacklists benefit everyone (except the spammers) by reducing the overhead of emailing. Occasionally, legitimate emailers get caught in a honeypot and added to a blacklists. That’s how MxToolbox, helping legitimate businesses understand the blacklists they are on and how to get off the list. IP Address blacklists should be checked using the IP address of your mail servers or, in some cases, your web servers. An IP address on a blacklist indicates that spam or malware has originated from that IP address, or potentially there is an email configuration that promotes spamming or is the source of a botnet attack. Each blacklist specializes in monitoring different types of bad online behavior (spam, malware, botnets, exploitable email configurations, etc), so check the individual blacklist description for more information. Domain blacklists are a little different. A domain blacklist lists domains that have been included in links or content of spam emails or those known to house malicious or exploitative software. If your domain is on a domain blacklist, chances are your reputation or your website is being used for nefarious purposes and you need to correct it immediately. If you are blacklisted, MxToolbox is often able to provide information around the blacklist you are on. This may include your reason for listing. You will find a DETAIL button for each blacklist upon which you are listed. For example, CBL is primarily for sending spam, probably resulting from a malware or virus attack. 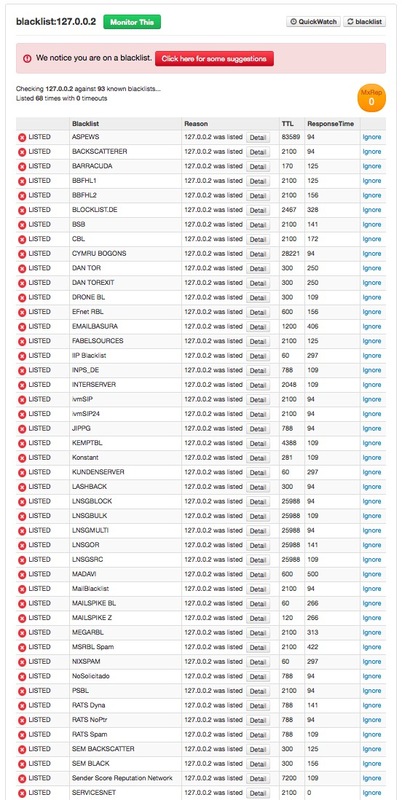 Now you know what to check your server for before approaching the blacklist for delisting! You’re on a blacklist and you want off. On each blacklist detail page, MxToolbox provides links and steps for delisting your mail servers from the blacklist. Each blacklist is a little different. Some may require more information, others may just require you to fill out a request form. Regardless, you must fix the problem before you request delisting! If you don’t you will be relisted and most likely have to jump through bigger hoops or experience longer delays the next time you request delisting. Note: Some blacklists ask for donations or payments for express delisting. It is MxToolbox’s belief that delisting should be free. We only search blacklists that are legitimately used by companies or organizations to reject email and have free delisting. It is up to you to choose if you would like to pay for an express delisting or donate to the blacklist. Contact Us is you feel like a blacklist is unfair or unethical. The next topic is analyzing email server setups and troubleshooting using MxToolbox.